I'm compulsive and the quote, "A foolish consistency is the hobgoblin of little minds" (Ralph Waldo Emerson), amuses me as I have never had any trouble thinking of myself as having a "little mind". But I have decided that as long as I am not too obsessive about it being somewhat compulsive is not a bad thing especially for someone who lives in a modest sized motorhome and who backpacks. It has also come in handy organizing John's photos on Flickr . I started this blog to chronicle our travels since we first hit the road in April 2010. However, this post covers a trail running trip in Chile and Argentina that John did ten years ago. My compulsive side is disconcerted by this but there are precedents as I have already included posts about trips we took before hitting the road; to Tanzania in 2007 and Nepal in 2008. We decided that his photos and trip description are certainly "blog worthy" so even though I was not along I am willing to overrule my foolish consistency and post it now. Something that makes this easier for me is the fact that we are seriously talking about going to Patagonia in early 2016. So, until I get to see this amazing part of the world for myself I will be content with experiencing John's trip vicariously just like everyone else. What follows is John's account of his adventure. I've always loved trail running. Covering great distances on foot is something really special. Seeing that far point on the horizon and thinking, I’ll be there in just a few hours. Then looking back and thinking, Wow, I started way back there not too long ago. I've run the Wonderland Trail twice, around Mt St Helens and large stretches of the Pacific Crest Trail. I don’t go fast. I take lots of pictures. I take the time to talk to anyone I meet on the trail. I've been told, “You don’t seem to be much of a hurry.” That’s true. The running is just a faster mode of transportation that allows me to get deeper into the wilds in a day. Devy Reinstein offers unique South American trail running and trekking trips with his company Andes Adventures. Devy does a terrific job. He basically does all of the worrying for you. You just have to show up. You run. You eat. You sleep. You socialize. You tour. It’s wonderful. This trip is an incredible value and you efficiently hit three of the most desirable backcountry areas in Chile and Argentina: Torres del Paine, Fitz Roy, Cerro Torre, Tierra de l Feugo . Since this was my first international trip, Devy’s style of travel made it a special joy. On this trip the trekkers and runners travel together except for the Torres del Paine circuit. This helps to balance the travel numbers for transport, lodging and food. The runners run and the trekkers trek. In fact even on the Torres del Paine circuit a fast strong backcountry walker can cover the distances (up to 20 miles a day) just fine. Day pack weights are light because of the refugios at Torres del Paine. Altitude is not a problem on this trip at all, though weather and wind can be significant issues. I traveled in December of 2003. December tends to be less windy, but the weather is not usually as clear as January or February. This trip has tourist as well as running aspects. Since the trail runs are the main highlights, I’ll cover those first and then hit the more touristy parts. The detailed itinerary is on Andes Adventures and hasn't changed since I did my trip. My intent here is to just give a flavor for the trip. Many more of these trip pictures are available on Flickr. Torres del Paine is a small but spectacular mountain range. Small enough to run around, but spectacular enough to be on most folk’s bucket list. Travelers talk about the “W” and the circuit. The “W” includes the Ascencio Valley, French Valley and the Grey Glacier. The circuit goes around the whole range. At running speed the circuit becomes a comfortable four day trip. Day trip to Las Torres, Parque Nacional Torres del Paine, Chile. Las Torres – Ascensio Valley, Parque Nacional Torres del Paine, Chile. This day trip starts from Refugio Las Torres. Refugio Las Torres, Parque Nacional Torres del Paine, Chile. I got up at 3:00 to ensure that I made it to Las Torres by sunrise. Devy had a special breakfast made up for me the night before. I was the only person at Las Torres at sunrise under perfectly clear skies. John at Las Torres, Parque Nacional Torres del Paine, Chile. I waited a long time for the other runners who were running late and then headed down. Ascensio Valley, Parque Nacional Torres del Paine, Chile. I ran into the other runners about 1/3 of the way down and decided to go back up for a group photo. It had started to cloud up a bit by then. The runners at Las Torres, Parque Nacional Torres del Paine, Chile. For this trip I had a Canon G2 point and shoot camera. I shot a lot of panoramas since I didn’t have a wide angle lens. The scenery in Patagonia worked really well for panoramas. In looking back on these photos I’m amazed at how well the images from this, now very old, camera hold up. Looking down the Ascensio Valley at Lago Nordenskjold, Parque Nacional Torres del Paine, Chile. Color in the Ascensio Valley. Wildflower in Ascensio Valley, Parque Nacional Torres del Paine, Chile. The Torres del Paine Circuit. Trail runners and guide starting on the Circuit. Heading into the Rio Paine valley. Our refugio for the night is at the end of this valley around the ridge to the left. Rio Paine valley, Parque Nacional Torres del Paine, Chile. Taking so many photos, I often ended up well back of the other runners. I saw no need to hurry through such pretty country. John running across the Rio Paine valley, Parque Nacional Torres del Paine, Chile. Lago Paine comes into view across Rio Paine valley. Laro Paine, Parque Nacional Torres del Paine, Chile. A few wildflowers come into view. Wildflower in Rio Paine valley, Parque Nacional Torres del Paine, Chile. First view of Dickson Glacier. Dickson Glacier, Parque Nacional Torres del Paine, Chile. A preview of trail conditions to come. Muddy trail in Rio Paine valley, Parque Nacional Torres del Paine, Chile. Our home for the night at Refugio Dickson comes into view. Refugio Dickson, Parque Nacional Torres del Paine, Chile. Looking back over Cordillera Paine, there is a condor just about dead center in this photo. Cordillera Paine from Lago Dickson, Parque Nacional Torres del Paine, Chile. Sun setting across Lago Dickson from the refugio. Lago Dickson and Dickson Glacier, Parque Nacional Torres del Paine, Chile. Cooking at Refugio Dickson. This is a fairly new refugio with hot showers and a top notch cook. It is quiet and the least crowded of the refugios on the circuit. The only way in is via horse or on foot. One of the great things about a trail running trip is the quick friendships with kindred spirits. Eating at Refugio Dickson. The second day is the most challenging. You have to make it through about a mile of bogs, over the snow fields to Paso John Garner and down through the monkey forest before you get to Refugio Grey at the snout of the Grey Glacier. Here we all are, still neat and clean, getting ready to head out from Refugio Dickson. Luckily the tree that broke the bridge across Rio de los Perros made a new bridge. Rio de los Perros, Parque Nacional Torres del Paine, Chile. Icebergs fill the lake at the base of Ventisquero Perro. Ventisquero Perro, Parque Nacional Torres del Paine, Chile. An avalanche came down while I was watching. Avalanche at Ventisquero Perro, Parque Nacional Torres del Paine, Chile. At Campamento Los Perros, there is a very friendly attendent, refreshments, and showers. These bogs run on for about a mile. Pretty slow going. Luckily I had been forewarned. Bogs on Torre del Paine Circuit, Parque Nacional Torres del Paine, Chile. Wear gaiters and lace your shoes extra tight and you just might not lose a shoe. Bog on Torre del Paine Circuit, Parque Nacional Torres del Paine, Chile. Weather coming in on Paso John Garner. Visibility was just good enough for long enough to get through. Snow storm on Paso John Garner. Looking east. Parque Nacional Torres del Paine, Chile. When in doubt follow the orange paint. Heading over Paso John Garner. Parque Nacional Torres del Paine, Chile. Once over Paso John Garner, the Grey Glacier comes fully into view from the snout all the way around the bend to west. Grey Glacier taken from below Paso John Garner showing the snout to well up glacier. The snout of the Grey Glacier and Lago Grey before I dropped down through the monkey forest. The destination for tonight is at Refugio Grey just a short distance down lake from the snout. Snout of the Grey Glacier and Lago Grey. Looking at the sun dappled finger of Glaciar Pingo flowing into Glaciar Grey. Glaciers Pinto and Grey, Parque Nacional Torres del Paine, Chile. The roughest trail section of the Torres del Paine Circuit is down through the alpine scrub. This is commonly called the “monkey forest” since you have to almost swing from branch to branch to get down. “Monkey forest” above Grey Glacier, Parque Nacional Torres del Paine, Chile. Once down from the forest I went out onto a peninsula that juts into Lago Grey for fantastic views of the snout. This photo shows about the eastern 1/3 of the snout. The Grey Glacier is nearly at the end of the Southern Patagonian Ice Field which extends 200 miles to the north, the second largest extrapolar ice field on the earth. Snout of Glaciar Grey, Parque Nacional Torres del Paine, Chile. The glacier's rock carving can be clearly seen on the right side of the Glaciar Grey. Glacier carved rock at the snout of Glaciar Grey, Parque Nacional Torres del Paine, Chile. Iceberg floating on Lago Grey taken from the peninsula at the snout of Glaciar Grey. Lago Grey, Parque Nacional Torres del Paine, Chile. Heading up from Refugio Grey on day three, I could now see the full snout of Glaciar Grey. The pictures above are just the section on the right. Refugio Grey is quite a bit more crowded since it is accessible by foot and boat. Lago Grey and the full snout of Glacier Grey, Parque Nacional Torres del Paine, Chile. Another runner and I pass our lunch porter pretty early in the morning. Normally he would meet us far down the trail, but he was a bit slow. We grabbed our sandwiches and cokes and were good for the rest of the day. The next destination is the French Valley. I want to go as far up this valley as time will allow. It goes deep into Torres del Paine and yields fantastic views. Paine Grande guards the valley on the left and the horns guard it on the right. Paine Grande and Glaciar Frances, French Valley, Parque Nacional Torres del Paine, Chile. Looking back down the French Valley toward Lake Pehoe. Lago Pehoe, Parque Nacional Torres del Paine, Chile. Moving slowly up the French Valley along Rio del Frances heading to the mirador (viewpoint). Rio del Frances, French Valley, Parque Nacional Torres del Paine, Chile. Up the French valley I had unusual views of the horns including Cuerno Norte. The more classic view most folks see is from the southside of Lago Pehoe. Cuerno Norte, French Valley, Parque Nacional Torres del Paine, Chile. They definitely want to make sure that you don’t miss the mirador in the French Valley. Mirador, French Valley, Parque Nacional Torres del Paine, Chile. From the mirador, I had a fantastic panoramic view of nearly every peak in the French valley - amazing. Panorama from the mirador, French Valley, Parque Nacional Torres del Paine, Chile. A unique phenomenon in Patagonia is ice (rime) mushrooms that form with wind and unusual moisture circumstances. These mushrooms and rock pinnacles are casting glorious cloud shadows from the top of Paine Grande. Rock pinnacle and ice (rime) mushroom cloud shadows on Paine Grande, French Valley, Parque Nacional Torres del Paine, Chile. Now my goal is to make it to the refugio by dark. Alpenglow on Paine Grande, Parque Nacional Torres del Paine, Chile. Day four is just a half day run along Lago Nordenskjold back to the van. Georgia Daniels, Parque Nacional Torres del Paine, Chile. And then a tight squeeze on the way out of Torres del Paine. All of our photos taken in Chile are on Flickr. Tight bridge at Parque Nacional Torres del Paine, Chile. The two runs we did out of El Chalten are simple day trips. Based out of the Alburgue Patagonia, we just waited for the breaks in the weather to have a chance to see some peaks. Climbers have spent weeks for good enough weather to climb Cerro Torre or Fitz Roy. Sometimes the good weather never comes. We just wanted to catch a glimpse. The trailheads for both trips start right in El Chalten. Fitz Roy - After climbing up a bit from El Chalten, you get good views of the Rio Electrico valley and also back to the town. Rio Electrico valley, Parque Nacional Los Glaciares, Argentina. The running is easy, I just hoped the clouds would lift a bit. John headed to Fitz Roy, Parque Nacional Los Glaciares, Argentina. And the clouds did clear a bit revealing most of Fitz Roy and Poicenot. Mt Fitz Roy and Poincenot, Parque Nacional Los Glaciares, Argentina. Most of the range popped into view. After dropping down to the climber’s camp at Campamento Rio Blanco. Campamento Rio Blanco, Parque Nacional Los Glaciares, Argentina. I climbed up to the mirador on the terminal moraine above Laguna de losTres to see four climbers returning to camp walking across the frozen lake. Climbers returning across Laguna de los Tres, , Parque Nacional Los Glaciares, Argentina. From the mirador I could see the clouds quickly sinking down on Fitz Roy and the lake basin. Glaciar and Laguna de los Tres and cloud shielded Mt Fitz Roy, Parque Nacional Los Glaciares, Argentina. On the way back the valley was still clear and I could see all the way down the Rio Electrico valley to Lago Viedma. Rio Electrico river valley and Lago Viedma in the distance, Parque Nacional Los Glaciares, Argentina. Cerro Torre is even more elusive than Mt Fitz Roy. It is just a little farther west and catches more of the bad weather. The trail head is right in El Chalten and some of the trekkers joined the runners today. Andes Adventures Cerro Torre runners and trekkers, Parque Nacional Los Glaciares, Argentina. Easy running in open country to Cerro Torre. The trail goes up the Rio Fitz Roy valley and climbs up a terminal moraine to Laguna Torre. Cerro Torre is lost in the clouds up Glaciar Torre on the other side of the lake. Laguna Torre with Glaciar Torre in the distance, Parque Nacional Los Glaciares, Argentina. Lots of icebergs sheared off Glaciar Torre and floated to the end of Laguna Torre. Laguna Torre and icebergs from Glaciar Torre, Parque Nacional Los Glaciares, Argentina. On the way out I climbed to a mirador above the Rio Fitz Roy valley for one last look to try and see Cerro Torre. 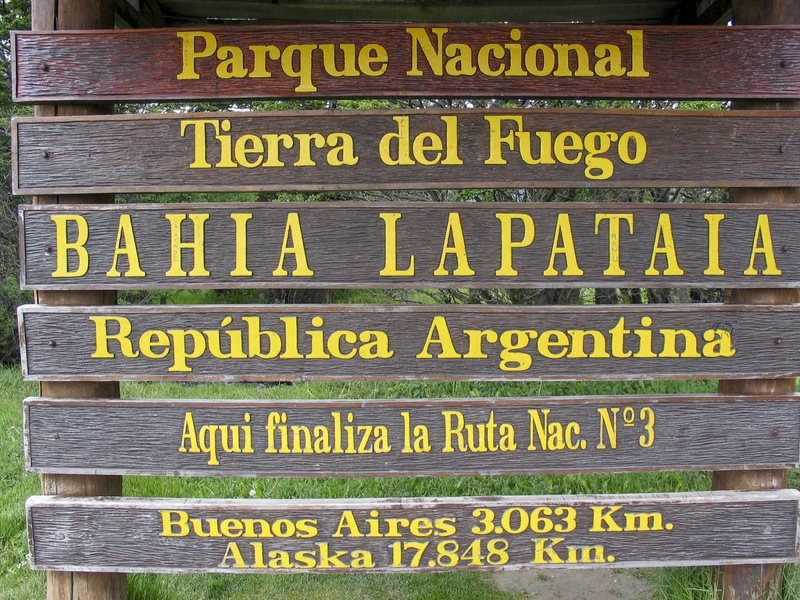 Tierra del Fuego - The final trail run on this trip is in the Parque Nacional Tierra del Fuego. This area doesn’t have the scenic icons that the other runs do, but rounds out the trip nicely and gets you to the southern tip of the Western Hemisphere and the end of the Pan-American Highway. You can’t really practically drive the whole Pan-American Highway to Alaska because of the roadless Darien Gap in Panama. It’s a nice dream though. Only 10,000 miles to Alaska, Parque Nacional Tierra del Fuego, Argentina. Parque Nacional Tierra del Fuego, Argentina. … with views of the Beagle Channel. Beagle Channel, Parque Nacional Tierra del Fuego, Argentina. Beavers were imported for fur and have thrived due to lack of predators. Beaver pond, Parque Nacional Tierra del Fuego, Argentina. Fungus, Parque Nacional Tierra del Fuego, Argentina. Running along Lago Roca, the last run of this amazing trip. Thanks Devy. All of our photos taken in Argentina are on Flickr. John running along Lago Roca, Parque Nacional Tierra del Fuego, Argentina. Sunset looking over Punta Arenas toward Estrecho de Magallanes. The Andes straddle the border between Chile and Argentina. We crossed into Argentina to get to Mt Fitz Roy and Cerro Torre. You have to understand that they really like to eat meat in Argentina. On the way to El Chalten we stopped at the Glaciar Perito Moreno. This is another off shoot of the Southern Patagonian Ice Field that eventually flows into Lago Argentina. It is a long barren landscape on the way to El Chalten. The road to El Chalten, Argentina. Abelardo breaks the monotony on the bus to El Chalten, Argentina. Abelardo serves wine during the long drive. Patrice, our driver was getting a little sleepy on the monotonous drive. Georgia volunteered to drive the bus to give Patrice a break. It was fun for her and similar to the fire engine she drives working as a firefighter in Tacoma. Georgia and Patrice on the road to El Chalten. El Chalten is a quiet little town at the end of the road used mostly by tourists and climbers as a base camp. For Devy and Abelardo there is still office work to do. They do it so you don’t have to. Even at the end of the road there is an internet café. This fellow was shopping at REI in the USA - small world. I worked at REI for over 25 years. After El Chalten, we drove back to El Calafate and flew to Ushuaia. Ushuaia is a busy tourist port for trips to Antarctica and local tours of the Beagle Channel. 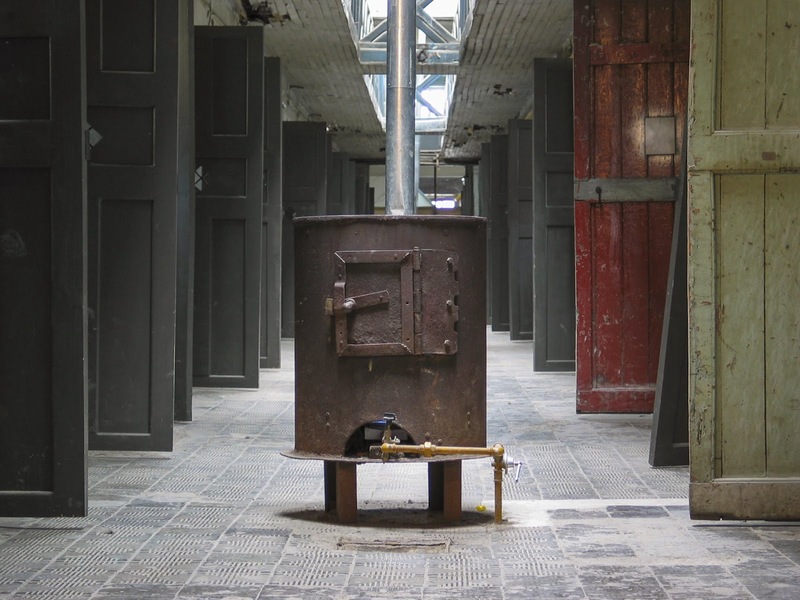 Ushuaia also had its own Alcatraz style prison. It is now a museum with interesting art. That sometimes gets out of hand. This place must have really gotten cold. It was eventually closed as too miserable and isolated. Sunset over the Ushuaia harbor. Sunset over the Ushuaia harbor, Argentina. The last stop on our trip was Buenos Aires. We arrived in December 2003 after the major currency problems in 2002. Buenos Aires is a very cosmopolitan city that was looking a little down at the heels. It reminds me of a brighter more open New York City. In fact, Argentina is 70% Italian heritage. I can imagine an emigrant standing in Naples looking up at a ship in the late 19th or early 20th century and flipping a coin to decide between New York and Buenos Aires. Both lands of opportunity, but maybe more opportunity could be found in the less settled Argentina. The romance of the old city still exists. For my first international trip I couldn’t have chosen better – great travelling companions and a wonderfully guided trip rich in back country and front country experiences. And now it’s time for the long flight home. 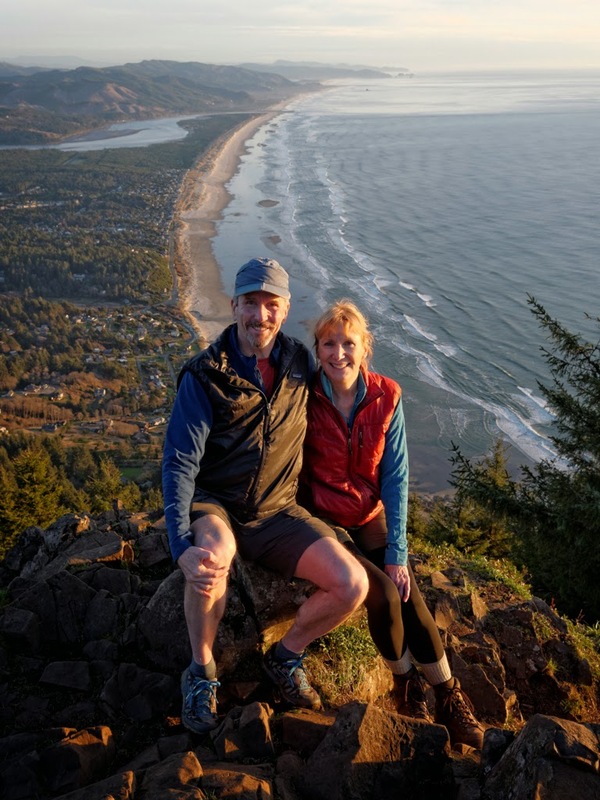 Back to the present - Those who read our previous post know that I (Jean) had a complicated wrist fracture back in June that required surgery and a major change to our plans for the last eight months. We spent much of the fall and winter just north of Seattle. Our two sons, Dan and Tom, visited us over the holidays which we spent in La Push on Washington State's coast. While there we did a bit of hiking on Second Beach and from Rialto Beach to the "Hole in the Rock" as well as a walk through the Hoh Rainforest, all within Olympic National Park. Later on John and I took advantage of some favorable weather windows to do some dayhiking where we revisited places we frequented when we still lived in a house. We visited Tiger Mountain several times including during a temperature inversion that bathed the Puget Sound region in cold fog and low clouds leaving the summit warm and clear. … and to Wallace Falls. A CT scan showed that my scaphoid has healed and my surgeon has released me from his care so we have finally begun to head south toward California. We are slowly making our way down the lovely Oregon coast. But our plans are not certain as it will depend much on the weather. We had been concerned about drought and fires in southern California but it now appears that rain, flooding and mudslides could be issues. So we will be monitoring weather and road conditions and plan accordingly. Such is the beauty of a nomadic lifestyle. We live in a competitive, achievement oriented culture here in the US and when we meet new people a common question is "what do you do?" Meaning what do you do for a living, how do you support yourself financially. Upon learning we are now retired a subsequent question is frequently "what did you used to do?" (although Europeans we have met in our travels are much more interested in hearing about where we have been). If the conversation with a new acquaintance lasts long enough we often get on the topic of whether or not we have children. Yes, we say, we have two boys; Dan is 28 and Tom is 26. True to form that often leads to the question, "What do they do?" Like most parents we love to talk about our kids so we enthusiastically say that Dan is Senior Electrical Engineer for Carnegie Robotics in Pittsburgh. If our audience seems the least bit interested we can continue to describe how he was instrumental in developing the stereoscopic vision of the Multisense S-7 robot head which "features a sophisticated range of sensors designed to give robots 3D awareness of its surroundings, including a laser range finder". 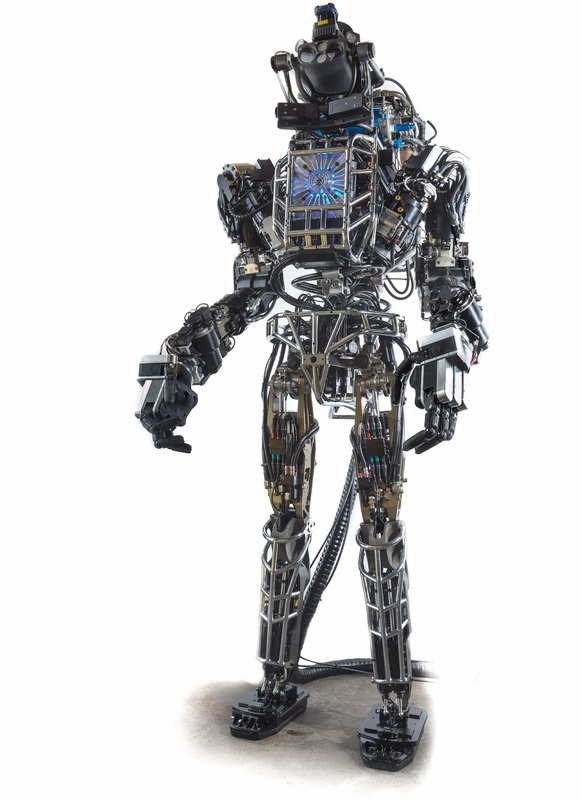 It is an integral part of the Atlas robots (built by Boston Dynamics) being used by several teams competing in the DARPA Robotics Challenge. And our other son, Tom, delivers pizza. It comes as no surprise to us that our two boys have turned out so differently from each other, there were obvious differences from birth. From a very young age Dan exhibited an intense curiosity about how things work. … or do anything relating to electricity. When we were house hunting prior to his third birthday he took a nightlight along so he could test the outlets. In preschool his favorite picture book was The Way Things Work by David Macaulay. In first grade his favorite reading material was the Radio Shack catalog. Dan loved Legos and had an extensive collection. Sets were built according to the instructions just once before he went free form. From a young age his creations included houses with straws for water pipes and dental floss for electrical wires. When he got a little older he utilized Lego Technics with the included pulleys and motors to build such things as cranes and cable cars. Dan enthusiastically embraced technology. He got his first computer at age four, an ancient Epson that I had purchased at his preschool's rummage sale for $25. However it was his Commodore 64 that really got him started. This was before we had access to the internet but with the help of some library books he taught himself BASIC and programmed it himself. He was nine when he built his first robot which was controlled by a joystick via his Commodore 64. Dan with his Lego Robot at his school's "Invention Fair"
When Dan was in fifth grade we got our first computer with internet access and his quest to learn more really took off. Before long he was building his own computers. Dan did Running Start, a program that enables students to attend community college their last two years of high school and obtain college credits. He was awarded an A.S. degree in Computer Science shortly after graduating from high school. During that time he developed a passion for high voltage electronics and constructed several different "Tesla Coils" ranging in size from a small portable one to one that was six feet tall. … and their first project was "Lobo". After viewing this video of Lobo's very first steps I jokingly referred to Lobo as our first "grandchild". Lobo was later joined by "Eddie". We got to play the "proud grandparents" when Eddie competed in the Seattle Robotics Society's Robothon where he won the "Judges Choice Award" in 2005 and the "Robo-Magellan" competition in 2006. After graduation Dan went to work for Hewlett Packard in Vancouver, Washington. He continued his interest in robotics as a hobbyist and maintained an extensive website (danstrother.com ) detailing his work. This got the attention of the president of Carnegie Robotics (in Pittsburgh, Pennsylvania) who contacted Dan and soon offered him a job as Senior Electrical Engineer with this growing company. We are not surprised by the direction Dan's life has taken. We knew from a young age that he was born to be a Electrical Engineer and there was absolutely nothing we could do to change that. All we could do was try to place the appropriate "tools" in his path and stay out of his way. On the other hand, Tom has always been a puzzle to us. He also exhibited intense interests from a young age but without the "laser like" focus that Dan had. Trains were his first "obsession". Tom and "Thomas the Tank Engine"
… and spent hours examining every detail in favorite books. He later shifted his focus to the Middle Ages and used his extensive Lego collection to build castles and wage epic battles between knights and forest men. His passion for knights led to an addiction for specific movies ("Knights of the Roundtable" and "Ivanhoe" in particular) and intricately illustrated books (St George and the Dragon by Margaret Hodges was a favorite). He elicited my help in constructing a series of costumes that he wore on a regular basis; at home, to the grocery, Home Depot etc. His love of costumes later expanded to include "super heroes". Other passions included "GI Joe", Transformers, microscopes, crystals, drawing, dinosaurs and archaeology. It was challenging to keep up with his changing interests and to know not only what "tools" to place in his path but where to obtain them. I was at a loss to find someplace to buy bones he could dig up and had to resort to picking up a dead opossum off of a road (I'll skip the gory details). Other times it was equally challenging to figure out just what his interest was. He was on his elementary school track team and became obsessed with ice hockey for a while, playing roller hockey at every opportunity. He was also on his junior high school wrestling team. Career testing in high school indicated he had an aptitude for the "protective services" so he tried ROTC but that only convinced him he didn't want a career in the military. He briefly considered being a fire fighter. After he graduated from high school he attended community college part time. He did eventually earn an Associate Degree but it lacked focus. His course work ranged from Philosophy to an online Physical Education class. He was essentially clueless about what he wanted to do when he "grew up". ... but not so much with Tom's. This is frustrating for me because I know that Tom is so much more than the image conjured up in one's mind when one hears "pizza delivery guy". He just doesn't match the stereotype. He doesn't drink, smoke or do drugs. He is completely self supporting and lives very frugally. He has some money invested, he regularly funds his Roth IRA and he has purchased decent health insurance (thank you Obamacare!). He has an interest in nutrition and prepares such meals as brown rice, lentils and vegetables. This is in utter contrast to coworkers who are frequently broke, spend their free time getting drunk (or high), live off of junk food and are one serious health issue away from bankruptcy. Tom has considered going back to college and has expressed interest in Behavioral Economics and Industrial Psychology. But he is uncertain at this time especially since he has coworkers who possess college degrees and have not been able to find a job related to their degrees. He simply wants to ensure that he gets good value for his (and our) money. However, while he is not enrolled in any formal academic program he is in fact a student. He in engaged in an informal "independent study" program. Over the past several years he has been an avid reader of thought provoking nonfiction books covering a wide range of topics; How We Decide by Jonah Lehrer, Freakonomics by Steven D. Levitt and Stephen J. Dubner, Drift by Rachel Maddow, The Power of Habit by Charles Duhigg and Naked Statistics by Charles Wheelan to name just a few. He has written a number of provocative essays with titles including "Cognitive Holism", "Cultural Drifting" and "The New Natural Selection". In recent years we have had many very long conversations with him about a variety of thoughtful topics where ideas spring from his brain like popcorn. John and I have both found it quite gratifying to listen to him. I remember one evening where we had a lengthy conversation about the vicious cycle of poverty and crime. He was trying to determine where in the cycle that intervention would do the most good. At work he has developed a "Zen like" attitude. He keeps his eyes open for jobs that need to be done as he has learned that helping the overall production to move more smoothly not only makes his job easier but increases his job satisfaction. It brings to mind the old saying "every job worth doing is worth doing well". And he reminds us of people we met in New Zealand who believe that every honest job is worth doing and therefore worthy of respect. At some point Tom stopped being concerned about tips; he simply tried to provide the best customer service he could. The end result has been that his tips have gone up. To me all of that is impressive as it indicates that he is an intelligent, thoughtful and caring person. But I know that by our society's standards none of it "counts" for anything because it doesn't yield a larger paycheck, it won't lead to a college degree and it won't even expand his resume'. He is still just a pizza delivery guy and in our society the stereotypical pizza delivery guy is a loser. This got me thinking about the nature of "success" and how our society measures it. When I looked up the definition of "success" I discovered that I subconsciously assumed it would include something about fame or fortune. But it doesn't. Rather, success is defined as the "achievement of something desired, planned, or attempted". My assumption surprised me as I pride myself on being a "minimalist" and not obsessed with wealth and material possessions. I am reminded of something I read in the book "Your money or your life" by Joe Dominguez and Vicki Robin. It is the concept of "enoughness" which describes the place where one has enough for survival and comfort plus some little luxuries but not so much that it is a burden and weighs one down. This concept comes easily to those of us with a "backpacker's mentality" and those who live in modest sized motorhomes. I also like to think of myself as unconventional and that I would have fit in with the quirky characters on the TV show "Northern Exposure". However, I was reminded of a great scene where the characters Ed and Ruth-Anne are talking about her two sons. Ed: Where are your kids now? Ed: What happened to him? Ruth-Anne: Life's full of surprises, Ed--some happy and some not. If I am completely honest with myself then I have to admit that due to my own bias my first thought is to think that someone making a lot of money, say an investment banker, is just more "successful" than someone who obviously makes much less, such as a truck driver. And if positions were reversed and someone told me of their two sons, one who was an electrical engineer and the other a pizza delivery guy, I would subconsciously measure their relative "success" in my mind and the pizza guy would not fare very well. But I came across something that I believe will help me to not only understand why I have my bias but to discard it as well. It is this 20 minute video given by Clay Christensen, the coauthor of How will you measure your life?. While the book is well worth reading I found what he says in this talk to be more accessible to my simple mind. He talks about the human pursuit of achievement and our inclination to aggregate things in order to measure our success. This need to add things up is because we humans have limited minds. He states that when we have "an extra ounce of energy or thirty minutes of time instinctively and unconsciously…" we will "…allocate it to whatever activities in your life that gives us the most immediate evidence of achievement". He goes on to say that quite often it is our career that provides us with that sense of achievement whereas investments in family don't pay off for a very long time. He also says that "the way we invest our time, and energy and talents causes us to implement a strategy we wouldn't at all plan to pursue". He concludes this talk with his belief that one's life will be measured by how well one has helped other people to be better people. He is religious and states that only God's infinite mind can look at each individual interaction we have ever had. But even a Pagan like me can learn something from his concluding statement. It points out the foolishness of trying to pigeon hole people as "successful" or "unsuccessful" based on very limited information such as income or job title. I can now see that it is impossible to accurately measure anyone's life, even our own, because we can't truly know the impact that any of us have had on the people we have encountered throughout our lives. All we can do is try our best to have positive interactions with those individuals we meet, spend more time with our family and try to ensure that it will all add up to be something worthwhile. I am reminded of something Ton wrote in his essay "Primal Cues". He describes primal cues as "subconscious messages which provide subtle influences into the what, how, and why of our actions". He concludes it with the suggestion that we replace "In God We Trust" on our currency with "Work hard. Be nice". I think that is an excellent idea. Most likely John and I will reach the end of our road before either of our sons reach their final destination in life. But while we are still around we will sit back and thoroughly enjoy observing them as they travel on their respective paths. And the next time someone asks me what our kids do perhaps the most accurate answer I can give is that they work hard, they are nice and we are very proud of both of them. Dan now works with Uber's Advanced Technology Group in Pittsburgh developing self driving cars. 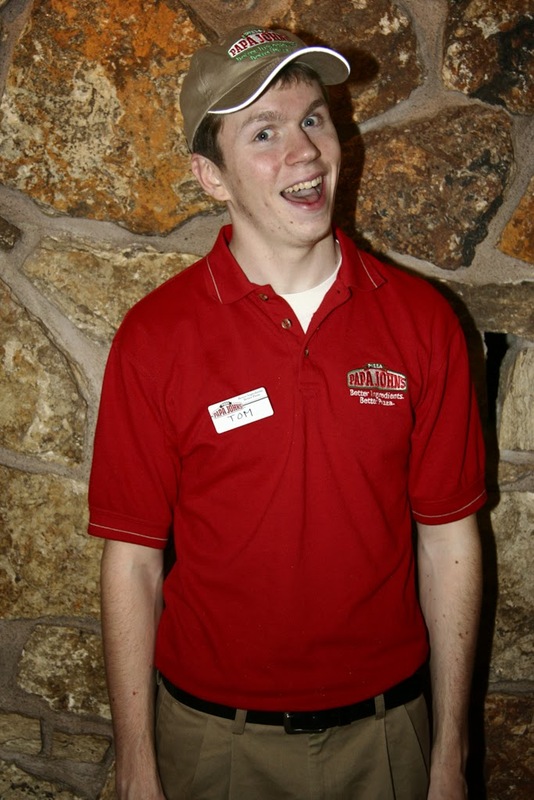 Tom is currently attending Eastern Washington University where he is majoring Psychology.